Hear from our Fund Managers, Ken Wotton and Brendan Gulston, as they share views on the market and discuss performance over the third quarter of 2018. Hear from our Fund Managers, Ken Wotton and Brendan Gulston, as they share views on the market and discuss performance over the fourth quarter of 2018. 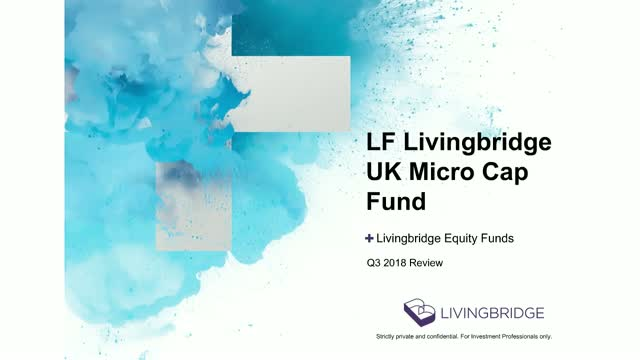 Ken Wotton and Brendan Gulston, the Fund Managers of the LF Livingbridge UK Multi Cap Income Fund discuss how its smaller company focus helps the Fund to seek to outperform. While small and micro caps may often be overlooked and under-researched, they can potentially offer fantastic opportunities to generate meaningful dividend growth over the life of the investment, as well as the potential for capital growth. The LF Livingbridge UK Multi Cap Income Fund has outperformed all of its competitors in the IA UK Equity Income Sector since launching in June last year. Fund Co-Manager, Brendan Gulston, looks at five key drivers of outperformance. For Professional Investors Only. Past performance is no guide to the future. The value of investments and the income from them can fall as well as rise and you may get back less than originally invested. Source data: FE Analytics, LF Livingbridge UK Multi-Cap Income Fund, C share class, Accumulation units, since launch in 1 June 2017 to 30 June 2018. IA UK Equity Income Sector peer group performance average calculated over same period. Incorporated in 1857, Gresham House is one of the oldest companies in London still operating today and assets under management currently exceed £2.1bn.